Depart from Houston airport and fly in direction of Europe, Austria, Vienna. Arrival in Vienna, the capital of Austria. The luxury bus with attendant team (including your tourguide) will be waiting for you at the airport. We'll enjoy a sightseeing tour of Vienna, the former capital of the Austro-Hungarian Empire for more than six centuries (which left a definite mark on it). From the windows of your bus you will see the highlights of historical Vienna. The circle within the Ringroad is an unforgettable experience, constructed in 1857, 2.5 miles long, and is surrounded by the representative buildings (National Opera House, New Townhall, National Theater, Parliament, museums, universities, fancy hotels and shops). Have your cameras ready! We will then get off the bus close to the main square which can boast of the beautiful St. Stephen Church (largest in Austria) and shopping opportunities. In the afternoon continue on our way to the Czech Republic, check-in our hotel in Lednice, the southern part of Moravia. This day we will spend in a beautiful region of Southern Moravia, known for the production of wine and beautiful landscape. We will start the day with a tour of Lednice Chateau, which is the jewel in the crown of the Lednice-Valtice Complex and, at the same time, one of the most beautiful complexes in the English Neo-Gothic style in all of Europe. Tour routes lead through the chateau interior, from representative halls, to the princely apartments, rooms of the small princes and princesses. Then we will move to chateau gardens which have been included in the UNESCO list to witness unique 1 hour show of birds of pray. In the afternoon visit the National Wine Salon, where you can try all the best Moravian Wines, accompanied with an expert explanation and a chance to buy some at the end! In the evening PARTY in a wine cellar with a local band! Leave for Prague, the capital of the Czech Republic. We will have an amazing walking tour with the most beautiful highlights of Prague - beginning with Prague Castle and then on to St. Vitus Cathedral, Hradcany quarter, walk across the famous 14th century Charles Bridge with a gorgeous view of the Prague Castle, and continue on to Old Town Square to see the Astronomical clock. We will end the tour at Wenceslas Square, which has historically been the sight of many events including the 1989 Velvet Revolution demonstrations. The other option is to check-in our well situated hotel right in the center of the Old Town of Prague, where you can wander and shop at the numerous stores around. In the evening, board the historical tram ride taking you through the downtown of Prague all the way to the Vltava River – And then we'll enjoy a 2-hour dinner cruise on the river Vltava including buffet dinner and viewing all the illuminated beauties of Prague along the river by night. We'll have a party with accordion music too … It's truly an unforgettable experience!!! In the morning, leave for the Krkonoše mountains in the north of Bohemia to get to the highest point in the Czech Republic! A modern cable car will take us on the top of mountain Snezka which is at 1,603 metres (5,259 ft), the highest mountain in the Czech Republic. The mountain lies on the border between Poland and the Czech Republic and is sought after for its great views to both countries. After lunch, we will continue on our way to Germany and the capital city Berlin. Check-in our hotel. Today we take a tour of Potsdam, just a few miles away from Berlin. Most of Potsdam's many sights were built during the 18th and 19th centuries when the city was the residence of the Prussian kings. Potsdam is probably best known for its many castles. We will tour the downtown area of the city, including the Russian Colony of Alexandrowka. You can view the impressive Sanssouci Park which surrounds Sanssouci Palace since 1747. It was built as a residence for the Prussian kings and is probably the most famous. We will also see the Cecilienhof Palace which is famous for having been the location of the Potsdam Conference in 1945, in which the leaders of the Soviet Union, the United Kingdom and the United States made important decisions affecting the shape of post World War II Europe and Asia. Leave for the downtown of Berlin, free time for shopping and to do whatever you desire. Or optional tour of Berlin in the afternoon with local guide who will show us around and tell us all important details about the largest city of Germany and its capital – sights of former west and east Berlin – Brandenburg Gate (grand classical archway and city divide), Reichstag Building (historic, glass-domed home of parliament), Berlin Wall (remnants of former division), Checkpoint Charlie (Cold war and east-west border landmark), Alexanderplatz (pedestrianized square with iconic tower), Museum Island, Under the Linden Tree avenue and much more. In the evening you will enjoy a Dinner River Cruise of Berlin. In the morning leave for Kiel to embark the amazing ship MSC Meraviglia for a 7-day Nothern Europe Baltic Sea Cruise, check-in our balcony cabins, security training, tour of the ship and time to relax. Leaving the port of Kiel at 7:00 PM is truly an unforgettable experience! An exciting and trendy city split by lakes and surrounded by sea. There's an energetic and hip waterside vibe that permeates Copenhagen, one of Northern Europe’s most user-friendly capitals. Copenhagen city center is waiting to be enjoyed on an excursion booked through MSC. It’s a welcoming, compact city with a center largely given over to pedestrians (and cyclists) and an emphasis by day on café culture and top-notch museums. The historic core of the city is Slotsholmen, originally the site of the twelfth-century castle and now home to the huge Christiansborg Complex. Instantly lovable, Helsinki is remarkably different from the other Scandinavian Capitals, and closer both in mood and appearance to the major cities of Northern Europe. Today, cruisers will find a youthful buzz on the streets, where the boulevards, outdoor cafés and trendy restaurants are crowded with Finns taking full advantage of the short summer. Following a devastating fire in 1808, and the city’s designation as Finland’s capital in 1812, Helsinki was totally rebuilt in a style befitting its new status: a grid of wide streets and Neoclassical brick buildings modeled on the then Russian capital, St. Petersburg. Porvoo, one of the oldest towns on the south coast and one of Finland’s most charming, is one of the places you might want to explore on an excursion booked through MSC Meraviglia. Its narrow cobbled streets, lined by small colorful wooden buildings, give a sense of Finnish life before the capital’s bold squares and Neoclassical geometry. When you’re cruising the Baltic Sea with MSC Cruises, St. Petersburg is the port of call for you. A sophisticated capital of the Russian Empire, the cradle of the Communist Revolution of 1917, and a symbol of Russian stoicism due to the city’s heroic endurance of a three-year Nazi siege during World War II, present-day St. Petersburg has eased into modernity without sacrificing any of its old-world magnificence and charm, with shopping malls sitting alongside opulent palaces. You’ll find a great city when you step ashore from your MSC cruise ship, maybe the most beautiful in the whole of Russia. MSC Meraviglia offers excursions to the center of St Petersburg on the south bank of the Neva, with the curving River Fontanka marking its southern boundary. Many of the city’s top sights are located on and around Nevsky Prospect, the backbone and heart of the city for the last three centuries, stretching from the Alexander Nevsky Monastery to Palace Square. Seated on the banks of the River Neva, the 200m-long Baroque Winter Palace is the city’s largest and most opulent, and was the official residence of the Tsars, their court and 1500 servants until the revolution of 1917. Today the building houses one of the world’s greatest museums, the Hermitage, launched as Russia’s first public art museum in 1852. The Hermitage collection embraces over three million treasures and works of art, from ancient Scythian gold and giant malachite urns to Cubist pieces. Tallinn, Estonia’s compact, buzzing capital, with its enchanting heart surrounded by medieval walls, has been shaped by nearly a millennium of outside influence. A cruise of the Baltic Sea aboard MSC Meraviglia can take you to visit the heart of Tallinn, its Old Town, still largely enclosed by the city’s medieval walls. At its center is the Raekoja plats, the historic marketplace, above which looms Toompea, the hilltop stronghold of the German knights who controlled the city during the Middle Ages. Raekoja plats, the cobbled market square at the heart of the Old Town, is as old as the city itself. On its southern side stands the fifteenth-century Town Hall (Raekoda), boasting elegant Gothic arches at ground level, and a delicate steeple at its northern end. The fourteenth-century Church of the Holy Ghost (Puhä Vaimu kirik) on Pühavaimu St. is the city’s oldest church, a small Gothic building with stuccoed limestone walls, stepped gables, a carved wooden interior, a tall, verdigris-coated spire and an ornate clock from 1680 – the oldest in Tallinn. Contrasting sharply is the late Gothic St. Nicholas’s Church (Niguliste kirik), south-west of Raekoja plats. It now serves as a museum of church art, including medieval burial stones and the haunting Danse Macabre (“Dance With Death”) by Bernt Notke. After Disembarkation from the ship, our bus will be waiting for us and we will have a sightseeing tour of Kiel, an expanding urban center on the shores of the Baltic Sea. Kiel became the Imperial military port of Germany in 1871, and when its canal was opened to connect the Baltic and the North Seas in 1895, the town began to control the largest artificial waterway in the world. Then we will leave for Hamburg area. Optional agenda for the rest of the day in Hamburg downtown - Free time for last shopping and wandering in the city or visit Hamburg Miniature Wunderland with the World's largest model railway and miniatures of buildings and landscapes from all over the world! Departure home from the airport in Hamburg on a flight to Houston, HOME SWEET HOME! Itinerary subject to change depending on availability. TOUR INCLUDES: BUS TOUR includes program, hotel accommodations, flights, breakfast & dinner everyday, drinks with group meals, luxury climatically controlled tour bus with restroom on board and snacks, soft drinks, water, juice & alcoholic drinks served while traveling, a professional European English speaking tour guide, music, and money exchanged on the bus. On MSC SHIP MERAVIGLIA: Full board with Balcony Cabin, along with all inclusive drinks package & tips covered. Excursions during the cruise are on your own and may be booked through the ship MSC MERAVIGLIA. "What an everlasting memory we have of the last 12 days. I hope you and your family made it back to Hallettsville all safe and sound. Hope we can recover in a timely manner! BTW, I am listening to your Grand March CD and Texas Our Texas CD right now. You did one hell of a good job on these two CDs! I could listen to these over and over and over again ... I'll probably wear a hole in the CD!" 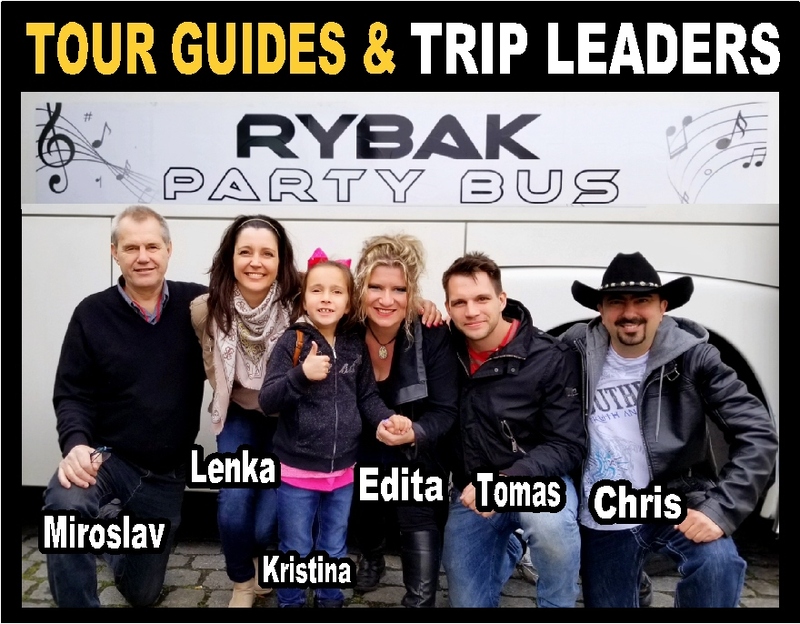 "Chris & Edita - I said it once and I will say it again, I had more fun with this group of Texans than all 5 of my past international trips combined. Thank you to everyone!" "The entertainment never stopped, nor did the slivo! I had a fabulous time!" Edita & Chris, Thank you for a wonderful vacation!!! This was the best ever!! Our favorites ... Edita's Mom's house and Dad's house, the school children in Lenka's hometown, the visit to the cows, seeing the old mill work, riding in the beautiful countryside, the fantastic food (reminded me of my Grandma's cooking...luv sauerkraut! ), parties at the truck stops, and of course Tomas serving our medicine! Thanks to all for giving us so many memories that make us smile. Chris and Edita, Vonda and I had a wonderful time in Europe. It was a trip of a lifetime for us. We had always hoped to visit the Czech Republic together. Thanks for this opportunity. And, once again we got to visit Robert's family. If you are interested in a Europe Tour (land and cruise), check out this group. They definitely keep you busy and you won't be disappointed, well worth every penny spent. Sightseeing, food, partying, great music, best tour guides and the friendships you make.